Take your gaming performance to the next level with the latest range of Corsair mice. These precision tools are designed to enhance your gaming, with key features like adjustable DPI, intelligent ergonomics, and configurable weight systems that give you total control over your set up. Whether you’re gaming professionally, or just playing to win, Corsair gaming mice allow you to play at your best. Designed for ultimate comfort and responsiveness, state-of-the-art laser sensors and high-quality materials provide the agility and control that professional gamers demand. The latest innovative Corsair mice range includes the Harpoon, Katar, Sabre, M65 Pro and the Scimitar Pro. The Harpoon RGB mouse is lightweight and contoured, featuring a 6000 DPI optical gaming sensor, texture molded rubber side grips, and onboard memory and is an ideal entry-level model. The Katar is ultra-responsive, lightweight and compact, with configuration settings developed by the world’s top gamers. The Corsair Sabre weighs just 100g, offers 10,000 DPI, a 1,000 Hz refresh rate, eight configurable buttons and super-responsive switches. With four-zone multicolour backlighting, you can personalise the look of your mouse to suit your style and gaming rig. See all Corsair keyboards and gaming accessories for a fully streamlined look. The M65 PRO takes things to the next level. This competition-grade FPS gaming mouse features an aircraft-grade aluminium frame for low weight and high durability. It features eight programmable buttons and a high-accuracy 12,000 DPI sensor for pixel-precise tracking and advanced surface calibration support. You can adjust the advanced weight tuning system to set the centre of gravity to match your play style, and harness the power of CUE for advanced button configuration, macro programming, and three-zone RGB backlighting customisation. 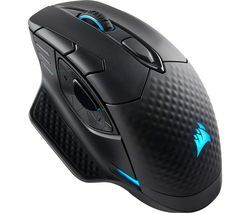 For MOBA and MMO fans, the Scimitar Pro is a leading MOBA and MMO favourite. Featuring 17 programmable buttons, programmable dynamic LED lighting and a native 16,000 DPI precision optical sensor, this mouse looks great as well as delivering stunning performance. Onboard profile storage means you can carry your customised settings with you. You can tune the mouse to your mousepad surface for optimal sensor precision and responsiveness and fine tune your gameplay using the customisable Key Slider macro button control system.